I announced a text about games, but meanwhile another idea came to my mind. Surfing the Web I encountered many questions about uploading files to a vintage palmtop, asked by the fresh owners of Portfolios, HP's etc. While it's fairly easy to do in Windows - just launch HyperTerminal, set up the connection and click "send" icon, remembering to choose a proper protocol (XMODEM usually) - I've never seen any tips about doing it with Linux. I know two ways to send/receive files to/from a palmtop with an RS-232 port (I use it with HP 95LX and NC 100, but it would work with Portfolio). This time nothing about Psion (hint: try plptools). for 57600 baud at the first serial port. 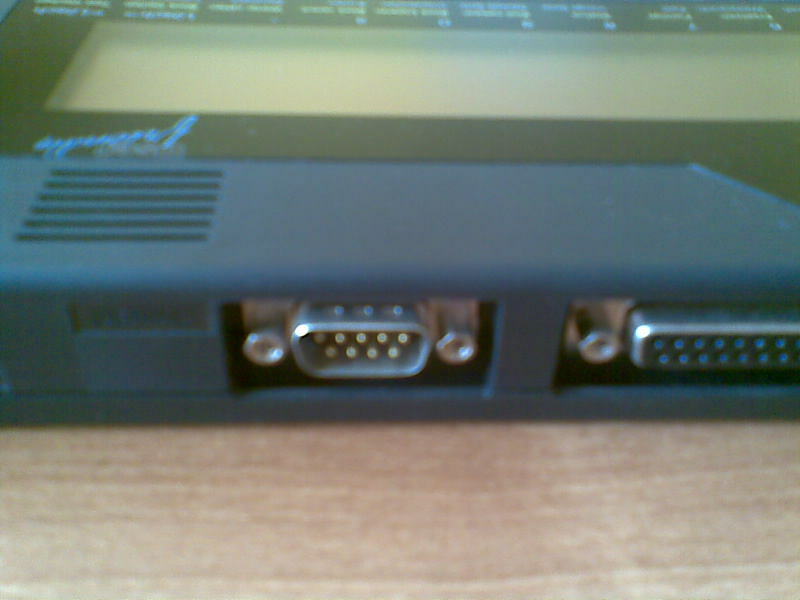 Important notice: nowadays computers (laptops especially) lack an RS-232 port. In this case an RS-232<->USB converter comes in handy. Mine is a cheap, Chinese no-name and it works well with my Ubuntu. When using such converter, your device is /dev/ttyUSBx (where x is a digit, usually 0). For diagnostics you may run dmesg | tail and check the name of the device (if any appears). If you want to use cutecom, just run the program and set the desired parameters in the main window. On your palmtop, set the configuration (on 95LX you only need to set the proper baud rate, leaving everything else unchanged; on an NC the defaults are just fine, just press Function-S to enter the terminal program). After connecting, choose the file to be sent from the PC. Now you need to set up the palmtop to receive the file. On an HP it's straightforward, just choose it from the menu. On an NC press Function-L to invoke the file list, then press Menu and T (Transfer). Choose the name under which the file will be saved on your computer. Remember to choose XMODEM as the protocol. Sending files from the palmtop to the PC is obvious. Here we'll use the palmtop as a Linux terminal. No need to install any communication software on the PC, but the package called lrzsz will be required. It provides, among others, two programs: sx and rx for sending and receiving files, respectively. Configure your palmtop as described above. On an HP 95LX you would want to set the terminal type to ANSI and turn wrapping on, but that's not necessary. After establishing the connection you will see the Linux login message prompting for password. Log in to your account (notice: serial connections are slow, so be patient). From the command line type sx filename to send a file from the PC to the palmtop. Set up the palmtop to receive files as described above. If you want to transfer files to the PC, use rx. Log out and close the connection. Hi, and thanks, it works ! 😀 Now I can finally do transfers with my NC-150. It’s just that I needed root privileges to use the ttyUSB0 and to use transferred files. You’re welcome 🙂 I hope you’ll find more useful tips for the NC family in my future posts.